One of the things I remember most clearly from my own childhood is playing outside after school with friends from my neighborhood. There was always something refreshing and special about running through the grass and climbing on the jungle gym until you couldn’t feel your arms and legs anymore! As it turns out, the benefits of outdoor play are endless. Not only do kids build and expand on their gross motor skills while exploring outside, but studies have also shown that kids sleep better at night after having been exposed to fresh air and sunlight. In today’s world, safety has certainly impacted the frequency and simplicity that used to come with allowing our kids to roam outdoors for hours on end. It’s important to keep in mind that outdoor play should never be fully replaced with sedentary play and screen time. I have outlined the gross motor benefits that outdoor play offers from a physical therapy standpoint, some general motor milestones to keep in mind to see if your child is on track, and some ideas for incorporating these into your child’s busy schedule. When you really think about it, outdoor play is essentially a gross motor work-out for your child, without even trying too hard! When the weather warms up, it becomes very motivating to run, jump, hop, and skip where there is ample room outside. Playing a simple game of tag with peers can work on a child’s endurance, keep their body busy in a healthy and productive way, and can teach them how to “play it safe” (no pushing!). Grab some sidewalk chalk and draw a hopscotch pattern on the driveway or black-top. Hopping in place begins around ages 4-5, progressing to hopping forward, skipping, and doing hopscotch at ages 5-6. Why not play a game of “red light, green light” trying out different activities in a “stop and go” fashion? Call out “green light” and have your child hop forward on one foot, then “freeze” when you call out “red light” and see if they can hold their balance on one foot without falling. Don’t forget to encourage them to use their non-preferred foot as well so that they are equally challenged. If it’s an extra hot day, bring out the sprinklers to keep cool! Make A Game Of It! Don’t forget about incorporating ball play skills when playing outside, including catching, throwing, and kicking. 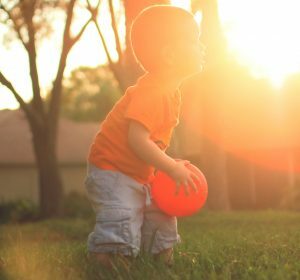 With these milestones in mind, don’t hesitate to bring a few different sized playground balls to the park or outside in the backyard to progress these skills for your child. Try out some water balloons for throwing and catching on a hot summer day! Ball play skills are important because they encourage peer interactions! It’s always more fun to throw a ball if you have a peer (or Mom, Dad, sibling, dog…) nearby to catch it! However, if your child wants to practice hitting or kicking at a target, you can always draw one with some colorful chalk for extra encouragement. Keep in mind that playing outside offers many opportunities to practice jumping with your kids. Children should develop the skill to jump up and down in place by 2 years, progressing to jumping forward 4-6” with both feet together. By 2 and a half years, your child should begin jumping down from 6” heights without resting their hands to the ground for support. As they grow older, the distance they can jump and the height they jump from should increase. While outside, use playground equipment and curbs (as long as they are safe) to encourage your child to bend their knees and then jump! You may have to hold their hands early on, reducing the level assistance as needed. Local playgrounds offer a variety of novel play equipment for your child to explore, working on strength, balance, and coordination. Take advantage of the monkey bars once your child is ready to start swinging across. Provide assistance at their pelvis to un-weight their body early on. Then, progress to having them swing across independently. Monkey bars offer a fun way to incorporate core strength, shoulder girdle strength, and motor planning skills. Try working on hip and ankle strength by having your child climb backwards up a small slide on their hands and knees, then slide back down! Try out some animal walks across the grass, pavement, and sand for a sensory experience while also tying in gross motor work. Animal walks may include bear walks, bunny hops, crab walks, donkey kicks, and many more (see my other blog post on which muscle groups are targeted with each of these). While safety should always be a priority, try to make outdoor trips to the park a regular part of your routine. Supervise your child as appropriate, but remember to keep it fun! Remember that sedentary play and staying indoors all summer long may actually be detrimental to a child’s gross motor development. Physical Therapists can also provide recommendations for activities and locations. If you have any concerns that your child is falling behind in the gross motor milestones outlined above, Eyas Landing Physical Therapists can evaluate to see if he or she may benefit from some extra assistance to meet their goals.